The world's largest collection of live recorded music is now right in your pocket, streaming for free wherever you go. Here at Paste Music, we’re constantly sorting through piles of new albums, interviewing musicians, making fun lists, and telling our readers about the songs they need to be listening to on any given day. But our first love has always been live music—the magic that happens when great artists create something spontaneous out of thin air and move people with it. That’s why we’ve spent so much time and effort acquiring and digitizing the world’s largest archive of live recordings—tens of thousands of concerts and hundreds of thousands of songs going back more than 50 years, including the complete archives of legendary promoter Bill Graham, the Newport Jazz and Folk festivals, the King Biscuit Flower Hour radio program, and more. We’re also adding new content to the vault every day with our ongoing recording projects at Paste Studio in New York and at our sister site, Daytrotter, in Davenport, Iowa. It is our mission to share with you all of this incredible live music, every day, for free. Where else can you find exclusive, one-of-a-kind recordings of Jimi Hendrix playing the Winterland Ballroom in 1968? Or Run-DMC playing ‘Rock Box’ on their first tour in 1984? Or LCD Soundsystem touring behind Sound of Silver in 2007? The library is so vast, it can be tough to know where to start. That’s why we’re announcing the all-new Paste Music & Daytrotter mobile app—the app that puts the entire vault right at your fingertips and lets you customize your very own listening experience. 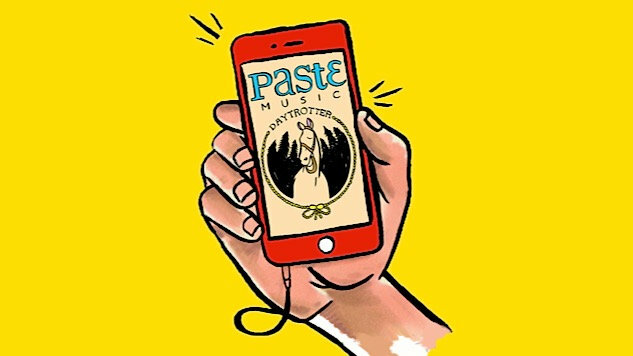 With the Paste Music & Daytrotter mobile app, you choose your own musical adventure. Start with the Staff Picks menu—maybe we can interest you in a Cream show from 1968, or a live Haim set from South by Southwest in 2012. Or dive into our Most Popular Concerts, where many of our users are hanging out and listening to our exclusive Who and R.E.M. concerts. Or check out all the recent performances recorded at the Paste Music and Daytrotter studios in New York and Iowa, with exclusive performances by Vampire Weekend, Bon Iver, Taj Mahal, Glen Campbell, The Drums, Steve Martin, and thousands of others. You’ll also find a treasure trove of stand-up comedy sets going back 30 years and interviews spanning the history of popular music with artists like Mick Jagger, Thurston Moore, Billy Corgan, and so many more. And that’s just the start! With the Paste Music & Daytrotter app, you can build your very own Vault by adding your favorite tracks to customized Playlists—and share them all with friends. Search your favorite band, your parents’ favorite band, the band you just saw play last week—in your friend’s garage. Save a collection of Favorites and build a Queue of songs so you never have to wonder what’s coming up next. Or set it to shuffle and see what gems emerge: maybe this Jerry Seinfeld bit from 1988; or this Clash show from 1981. With the Paste Music & Daytrotter, you’re in control of the world’s largest live-music vault, and your options are unlimited! Install the all-new Paste Music & Daytrotter mobile app for iPhone here and for Android here.